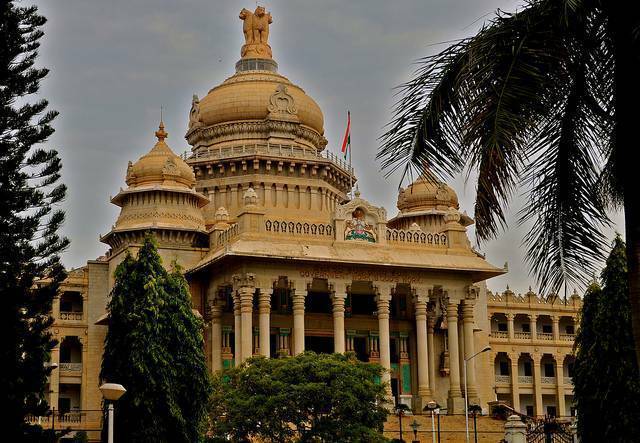 Vidhan Soudha, the legislative assembly house of Karnataka state is an imposing granite structure that speaks the charisma of neo-Dravidian architecture. The neatly manicured gardens and the monumental stairs that lead in to the assembly house finish the grandiose look this magnanimous structurehas to offer. The painstakingly artistic nature of this building is an embellishment of new and old style of architecture. The old Dravidian style prevalently seen with its ornately carved bases, rich pillars, intricate Kapotha style cornices, Chaithtya style archways and heavy pedestals mingling finely with the clean designs and building materials of new age, leaves an interesting collage of an architectural work.